Catladyland: Cats are Funny: Got a #FATCAT? Fess-up to Purina Cat Chow! Also, I'm Going to Mardi Gras! Got a #FATCAT? 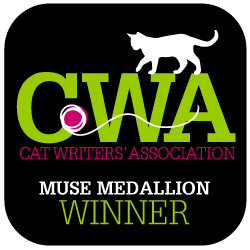 Fess-up to Purina Cat Chow! Also, I'm Going to Mardi Gras! Have you heard that a giant orange cat is traveling from St. Louis to New Orleans? It's true. The overweight cat featured on the Mardi Gras-inspired Purina Cat Chow Fat Cat Fess-Up Float is making its way across Missouri, Tennessee, Mississippi and Louisiana in an effort to raise awareness about feline obesity. Catladyland is the place to come for cat humor, but cat obesity is no laughing matter. According to the Pet Obesity Study for the Association for Pet Obesity Prevention, there are more than 46 million overweight cats in the United States. 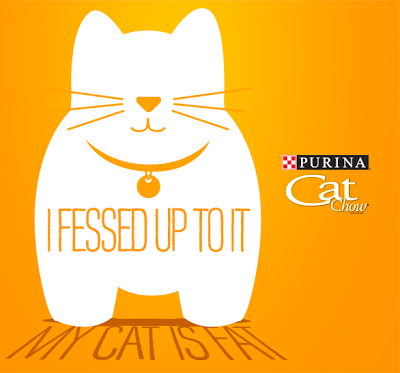 Purina Cat Chow Healthy Weight Formula is asking pet parents to pause the Mardi Gras festivities for a few moments and confess their own fat cat stories. And the Purina Cat Chow Fess-Up float is traveling to four states in one week to join local Mardi Gras festivities, capturing confessions and encouraging people to think about healthy feline weight. 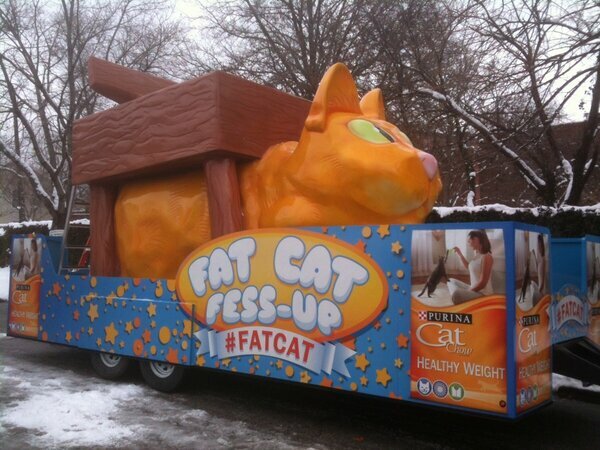 The Purina Cat Chow Fess-Up Float kicked off the road trip in St. Louis on Sunday and will make additional stops on its journey to New Orleans for Fat Tuesday. And guess what? This Sunday I get to join the tour and help spread the word! How exciting is that? Use the hashtag #fatcat on Twitter, Facebook, Flickr and Instagram. Join the Purina Cat Chow community on Facebook. And you can follow my updates from the parade trail here, and on Catladyland's Facebook page and Twitter feed.